1) What are your own origins, Rem? One fateful afternoon, on a class field-trip to the local library, I was flipping through a rather weathered copy of Strunk & White and sliced my finger on one of its pages. Obviously I thought nothing of it. The next day, however, I woke up and found my vision suddenly requiring spectacles and my hands sticking effortlessly to the keyboard. It must've been a radioactive paper cut. Shoe-horned parodies aside, I'm a Michigander transplanted to Saint Petersburg, Florida, where my days are spent drafting technical documentation for a software company. Most of my nights I try to compensate for that by writing things that are not snooze-inducing. 2) What inspired you to create, ‘Disunity’? Disunity is Ron Batchelor's sandbox; he's just kind enough to share his toys with me. 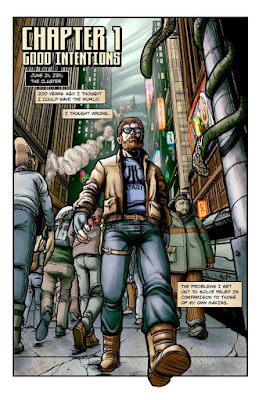 The story was originally conceived as a solo endeavor for Blotch Comics (Ron's imprint), although the plot soon grew too large to be actualized by a single creator. This is when Ron decided he'd focus on the visual execution while bringing in a dedicated writer to handle scripting his narrative. I had just wrapped up an editing gig for a Kickstarter-funded comic, Tesla Stormborn, and was looking for a new project to join. Going from an editorial role back to a co-writing position couldn't have worked out better, as I was very much ready to stretch the muscles I wasn't able to exercise while serving as an editor. Really, Disunity and I just happened to be at the right place at the right time. 3) In your own words how would you describe this story? 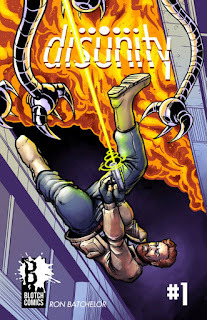 Sci-fi noir at its core, Disunity is a tale of horror and redemption. With John Connati, the series' protagonist, we intend to explore just how far a person will go when they are fueled by guilt. All intentions aside, John tends to break things the more he tries to fix them, which only perpetuates this cycle of regret. 4) What song would you say best represents this comic and why? What an awesome question. I've always associated the song, “Stay Useless” by Cloud Nothings, with a paralyzing sense of remorse. The character in the song is alone after having lost it all. This sense of loss has rattled him to the core -- it has him convinced that he's damned if he does, or doesn't, pursue getting unstuck. If there was a soundtrack to John's mindset as he tries to fix the reality he royally screwed over, this song might as well be on repeat. 5) If you could get a celebrity – either living or dead – to promote your wares, who would you choose, and why would you want to choose this particular person? My knee-jerk reaction? 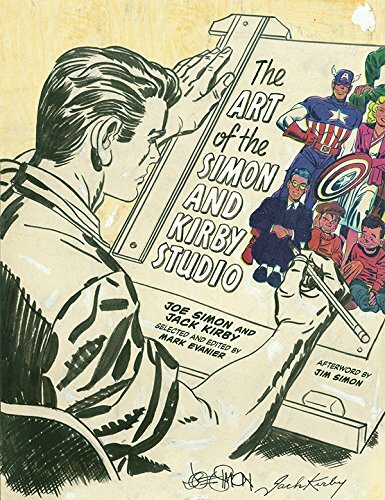 Jack Kirby. Because he’s the King. 6) What have you learnt about yourself through this endeavour? Working on this project with Ron, I found that most of the panels were already completed before I started scripting narration and dialogue. It was pretty much working backwards for me, which really threw me off at first. Instead of building a scene from scratch, I was essentially decoding to the panel, trying to eavesdrop on the narrative. It was a challenge at first, to trust that I was properly interpreting somebody else's work. For a good week or two John, Disunity's main character, was a stranger to me. But instead of trying to corner him, I waited. This is a bit of a feat for me -- I'm not the most patient of people. Writing had always been something I approached with a sense of urgency. Disunity marks the first time I considered being the tortoise instead of the hare. 7) During your time in this field, what is the one thing that has kept you in good stead? My productivity skyrocketed after stumbling upon /r/comicbookcollabs, a subreddit that serves as a job board, a showcase, a networking tool, and a practice space for indie creators. The community offers a wealth of talent and knowledge that has led to many successful collaborations. If I wanted to write in a vacuum, I'd stick to prose. Watching so many projects flourish thanks to crowdfunding and digital distribution has also been immensely encouraging. Kickstarter seems to be ushering in a new age of indie publishing. 8) If ‘Disunity’ had a motto, what would it be? The road to redemption lies. Now for more information on Disunity, please check out Rem and Ron's twitter or facebook pages. Go on. Click-click. And if you're feeling in a spending mood, why don't you grab yourself a copy by visiting its comixology page.